In the late 1990’s and after many years of successful kitchen, bath, and other interior remodeling projects, it became clear to Philbin Construction & Remodeling that a distinctive and well-built cabinet was one the most essential components in our client′s projects. 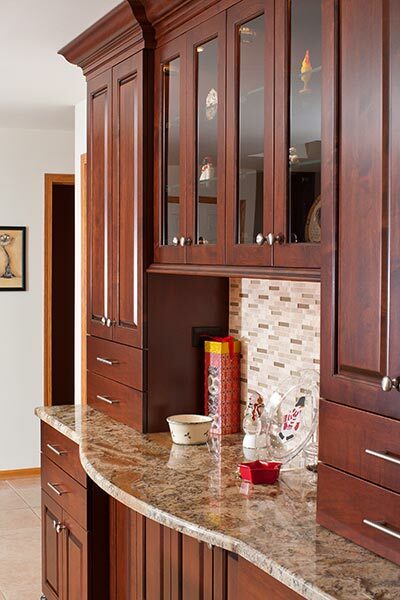 The long-term benefits of supplying & installing the best possible cabinets were easy to see, and after an exhaustive search, Wood-Mode & Brookhaven Cabinetry of Kraemer, Pennsylvania was the obvious choice. In our professional experience, no other cabinet line can come close to the depth of product offerings and door styles, the endless list of finish options and mouldings, or the overall durability and strength of a Wood-Mode or Brookhaven cabinet. Originally founded in 1942, Wood-Mode has a long-standing reputation for quality products that few other companies can match. Since 1998, we have been very proud to offer Wood-Mode and Brookhaven to our clients. Our showroom and design center was created to offer clients the opportunity to see many of the various applications for cabinetry, whether they may be thinking of a new kitchen, bathroom, or perhaps a home theater or office. Over 20 years as passed since we began our relationship with Wood-Mode and we look forward to a future of supplying and installing their amazing products in our clients’ homes. Our Mokena showroom is a warm and inviting place to spend some time. In addition to Wood-Mode and Brookhaven, stop in to see Woodland Cabinetry as well. A family owned and operated South Dakota company, Woodland is also a fantastic choice for your new kitchen, bath, or other interior project. While you’re here, also browse our selection of Cambria® Quartz surfaces, Corian Quartz displays, and see various types of tile & modern lighting for your new project! Call us today for an appointment. We’ll have a fresh cup of coffee waiting!